1 Wally the Walrus quickly swam in the icy sea toward a glacier in 1728. After he climbed to the top of the glacier, he saw a ship sailing through the cold, icy waters. The name of the ship was the St. Gabriel. Its captain was Vitus Bering. Bering was to make a discovery that Wally already knew. Wally had known all of his life that the continents of North America and Asia were not joined at any point farther north than where he lived. Bering learned of Wally's ideas. He named the waterway between the continents the Bering Strait. He gave St. Lawrence Island its name, too. 2 A few years later Ollie the Sea Otter was sunning himself in the kelp in 1741. He saw two ships sailing toward him. He had never seen ships before. Ollie made his home on Kayak Island. This island is just off the Gulf of Alaska's coast. Ollie saw smaller boats coming to the shore. The men were rowing the smaller boats through his kelp bed. Ollie saw one man drawing and taking notes. This man was a German scientist named Georg Wihlm Steller. He wrote about all of the animals and plants. While Steller was writing, the other men were using spears to kill Ollie's family. They used their knives to take the fur. They left the island with the fur from Ollie's family. He was alone with the otters from other families. Not too long after the men left the island, other ships came and took Ollie's friends' fur, too. Many of his animal friends died. The men wanted their furs. By 1784, Ollie's eagle friends noticed many men packing and leaving Kodiak Island. 3 Monford the Moose was walking in south-central Alaska in 1867. He saw that things were different. There were not as many Russian men. Lots of the men had left. They went back to their homes in Russia. A Russian minister named Edouard de Stoeckl was talking near Monford. He was heard talking to the Secretary of State William Henry Steward. They were reading and talking about a document. The document was a treaty. 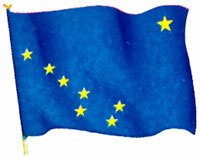 It said that the U.S. had bought the land of Alaska for $7.2 million dollars. Monford thought this was a good idea. He thought the Russian men were mean to the Alaskan natives. He had seen and heard the Russian men do and say bad things to the native husbands. The Russians wanted the natives to hunt for pelts. The Russian men held the native wives and children hostage as their husbands worked. Monford would be happy to see the mean men leave. Monford hoped that the new owners of the land would treat everyone better.